October 13, 2018 at 10:42p.m. A former employee at MS Consultants Inc. allegedly provided payments and benefits to ex-Youngstown Finance Director David Bozanich for at least 10 years during which the city awarded the company multiple projects worth millions of dollars. The Vindicator, working with sources and city documents, determined MS Consultants, a multistate architecture and engineering firm with a Youngstown office, is Company 2 in the 101-count corruption indictment that charged Bozanich, downtown developer Dominic Marchionda, and former Mayor Charles Sammarone. 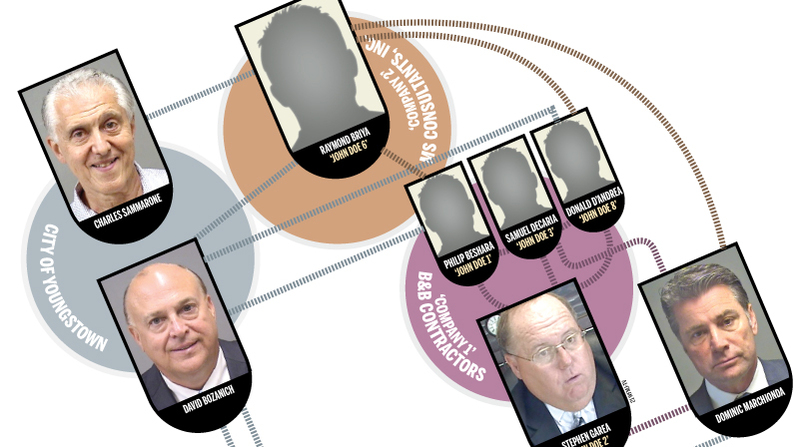 The sources and documents – along with court records – assisted The Vindicator in determining the identities of most of the unnamed companies and John Does in the Aug. 30 indictment that alleges a criminal enterprise involving Bozanich, Sammarone, Marchionda, a dozen of the latter’s companies and others. The unidentified companies and John Does in the indictment are believed to be cooperating with prosecutors. The newspaper learned Raymond Briya, a former MS vice president, is John Doe 6 in the indictment. He is a key person in the probe as he allegedly provided benefits from MS to Bozanich and Sammarone to obtain work for the company, and received benefits from Marchionda. The indictment states the employee stopped making payments to Bozanich and Sammarone in mid-2013 when a federal investigation into Bozanich’s conduct came to light. Over a 10-year period that ended in mid-2013, the city awarded MS dozens of design, architectural and construction-inspection contracts worth about $5.5 million, according to city documents. The work includes the Division Street extension, the Hazel Street extension, the Marshall Street Bridge project, the Phelps Street sewer replacement, improvements at the city’s wastewater treatment plant, the Brier Hill Industrial Park and the reconstruction of Federal Street. MS also served as the architect of record on Marchionda’s Flats at Wick and Stambaugh hotel projects. The indictment states that the company’s senior officials did not have knowledge of Briya’s actions. It should be noted that MS did extensive work for the city years before the claims in the indictment and continues to handle a lot of contracts for Youngstown. Attempts by The Vindicator to reach Briya for comment were unsuccessful. It is further alleged that Briya produced a false invoice for $105,000 on Marchionda’s Erie Terminal Place project – the indictment contends less than $10,000 worth of work was done – so the developer could pay off part of a $170,000 debt he owed MS for the Flats at Wick project. The indictment alleges that Marchionda provided Briya with an undisclosed “benefit” once the debt was paid. Briya allegedly made payments of more than $100,000 to Bozanich and $10,000 to Sammarone, when he was mayor, in return for steering city projects to MS, according to the indictment. Seven of the purported payments to Bozanich between June 2011 and July 2013 were made in the form of entry fees to golf tournaments. Bozanich would write a check to Briya to reimburse him, but Briya cashed the check and returned the money to Bozanich, the indictment says. In mid-2013, Bozanich allegedly returned $45,000 to Briya through his travel agency to hide it from a federal investigation into his conduct. Marchionda is accused of improperly spending at least $600,000 from city funds on personal items and of misusing an undetermined amount of money obtained from state and federal governments on the Flats at Wick, Erie Terminal Place and Wick Towers projects. Marchionda, Bozanich and Sammarone have pleaded not guilty to charges that include engaging in a pattern of corrupt activity, bribery, aggravated theft and tampering with records. The Vindicator also obtained a copy of the invoice from the city as well as a $35,500 invoice from Atty. Stephen Garea — John Doe 2 in the indictment while his law firm is Company 3 — and a $30,125 invoice from an accounting firm that the indictment claims were falsely created to pay off debts Marchionda incurred on the Flats project. The indictment says the accounting firm – determined to be Donald J. Augenstein CPA based on city documents and called Company 4 in the indictment while Augenstein is John Doe 7 – was not complicit in the creation of its invoice. The indictment also alleges that Briya joined two former employees of B&B Contractors and Developers – Company 1 in the indictment – to form Exal Leasing LLC, which provided Bozanich with $100,000 to push a project that didn’t materialize. The Vindicator has learned that Philip Beshara, former president of B&B is John Doe 1 in the indictment and Donald D’Andrea, a former vice president of B&B, is John Doe 8 in the indictment. The two formed the LLC with Briya. The indictment alleges that someone at Exal Leasing LLC made a $100,000 bribe or kickback through payments to Village Traveler, a travel agency of which Bozanich was part-owner, so the former finance director would promote an expansion to Exal Corp.’s plants in Performance Park off Poland Avenue. The indictment underscores that Exal Corp. does not own Exal Leasing and is not affiliated with it. Meanwhile, B&B filed a lawsuit against Beshara, Garea and former controller Samuel DeCaria, identified as John Doe 3 in the indictment, that alleged the trio engaged in a pattern of theft from the company that totaled between $2.5 million and $3.5 million. Another lawsuit filed this year targets D’Andrea along with Beshara and Joseph Tahos, a former corporate director at B&B. It alleges that the three men formed Liberty Consulting and Engineers LLC. They had an arrangement with at least three subcontractors named in the lawsuit who allegedly inflated costs and submitted false invoices to B&B at Beshara’s direction. D’Andrea, Beshara and Tahos, according to the lawsuit, deposited the checks into Liberty Consulting’s bank account between 2003 and 2011. Each received payouts of $24,400 between 2008 and 2009, the lawsuit claims. D’Andrea also provided undisclosed benefits to Bozanich, according to the indictment. September 9, 2018 12:01 a.m.